Hello and happy Friday to you all. We've had some absolutely gorgeous days this week, but last night it began raining and it is a dreary day today too. The weekend looks the same, so I think we'll be staying home and working on getting things ready for the garage sale next week. There are five of us on our street having garage sales next Saturday. I don't have good luck with them, but I'm going to try one more time. Maybe with several of us having sales, more traffic will come in. Dennis is taking Friday as a vacation day so he can help and do the lifting that needs done. Meanwhile, I spent Wednesday night at the lake and took these beautiful pictures yesterday. Finally some blooms! 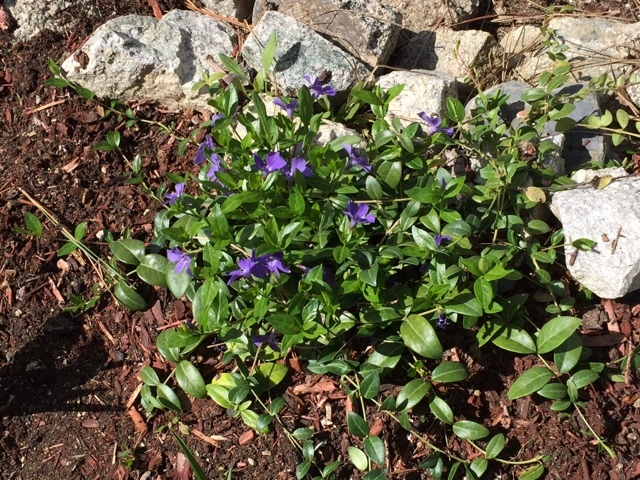 These are in the flower bed by the trailer. And these beautiful tulips are close to the park entrance. 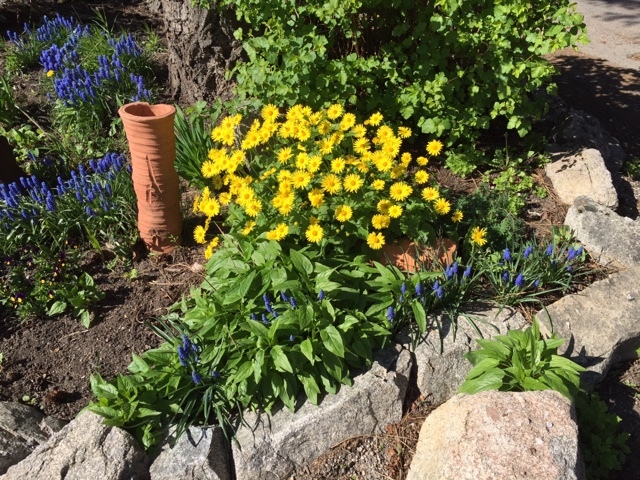 I don't know the name of these happy flowers, but they remind me of daisies and are so cheerful and bright. The purple and yellow look so pretty together. While I was walking I took these two pictures. 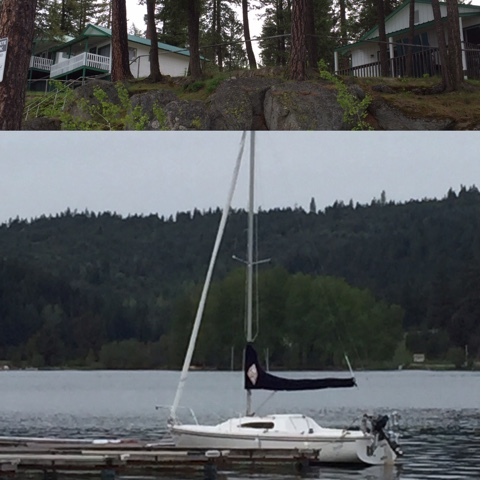 The cabins are all spiffed up and waiting for the summer visitors and the sailboat looks ready to take a voyage on the lake. I began the Amulet Shawl by Helen Stewart of the Curious Handmade Wednesday. I started this thing three times! I don't know what was wrong with me. 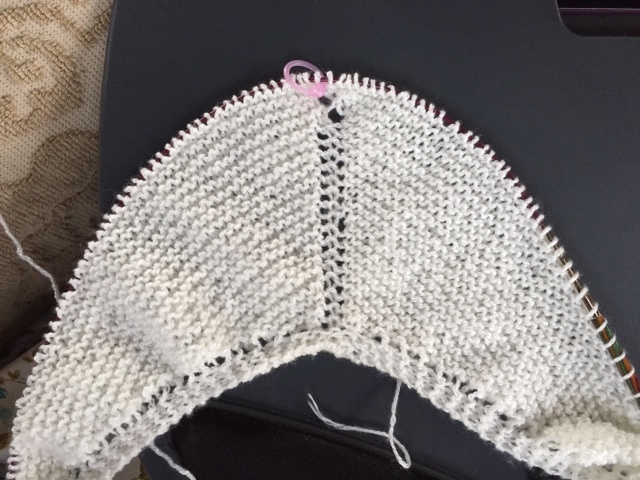 It's a fairly simple shawl pattern so far with just a few increases. Each time I would get to this point I would mess up. Do you see the huge holes just under the stitch marker? I messed up the m1's on either side of the center stitch. And I kept doing the same thing for some strange reason. I seem to be on the right track now though and finally have it past this point. I'm using a cream yarn I had in my stash and the yarn I showed you last week that I won from the Yarn Style podcast. I also purchased beads to add to it. 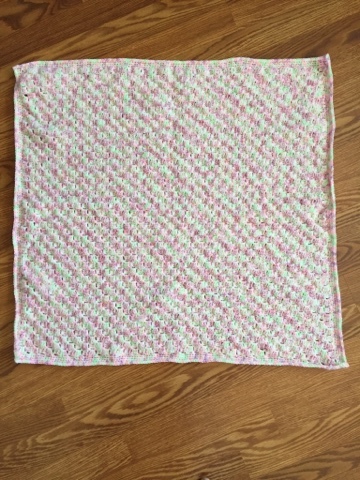 The corner to corner baby blanket was finished. It's being washed right now, so this photo doesn't show it blocked properly but you get the idea. This is a truer representation of the colors. It's a nice size blanket, about 36 inches square. I didn't have access to my computer when I made these or I would have used one of those, but here is my pattern anyway. I hope you can understand it since I'm not a pattern writer. Feel free to ask questions. Cut a purchased kitchen towel in half. I then sew a 1/4 inch hem on each towel. Alternatively, you can stitch twice along the width of the towel and cut between the stitching. The first row you sc as close to each end of the towel as you can. R22-sc across to end. Weave in ends. Sew on a button and you're done! I hope that made sense. As I said, I just made it up and I'm not a pattern maker. I highly recommend one of the patterns on Ravelry. I don't remember if I told you last week, but the x-ray they took on my back has shown absolutely no change in the bone since January. The break hasn't healed at all and they don't know why. I am now taking calcium supplements and yesterday they drew blood to check my vitamin D levels. Apparently that can affect bone growth. I've been walking, a lot of walking, but now I'm having dizzy spells again and almost fainting. No one knows why those are happening and the cardiologist says to talk to my primary care doctor and the primary says it's heart related. To say I'm beyond frustrated would be putting it mildly. I don't mean to bore you with all of this, and I know most of us try to keep our blogs happy, happy, happy but this is my life and I have come to think of you as my friends. I share my life with my friends. If you are praying people, I would definitely appreciate your prayers. Have a lovely weekend everyone and I'll try to keep up with your blogs. I'm trying to live out this verse and I know many others are facing much worse than I am. Beautiful flowers. It rained here last night also and the day is cloudy and cool today. I really like those towels. We have a couple that were my MIL's and the Hubba just mentioned that I needed to figure out how to do them. :) I hope you get some answers about your dizziness. It is very frustrating when your doctors keep passing you around. I hope you have a wonderful weekend. Happy Mother's Day. Will keep you in my prayers Betsy. Hoping you feel so much better soon! Happy Mother's Day! Have a relaxing and enjoyable weekend. So sorry to hear of your health woes...it can be so worrisome when there are no apparent answers. Enjoyed your photos! It's been nice here, too, until last night; we came home from choir in rain, and it rained again today while I was at the grocery store. 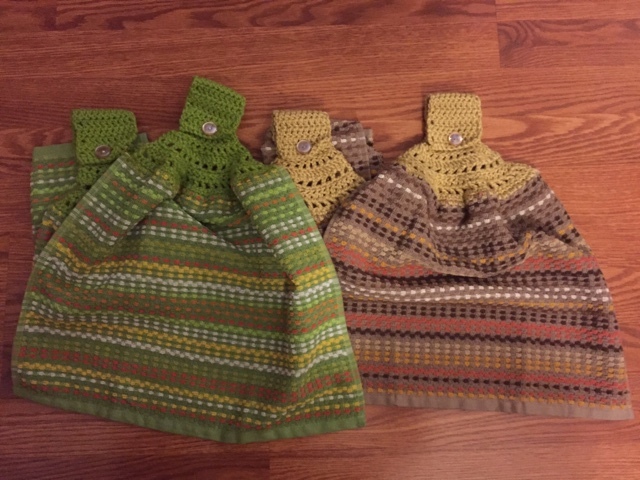 Love your projects, especially the colors on the baby blanket. Sorry to hear of your health challenges and hope the docs figure out how to get your back to heal! Prayers for your health issues. I know how frustrating these can be. I'm sure you're enjoying the flowers at the lake. It was quite the cold, snowy winter for you. There were alot of plants and flowers at Costco today. I saw one man with a beautiful lupine. I should have gone and bought one....but I didn't. Instead I bought clothes later. I enjoy those towels that you made. I had a friend make a few for me a couple years ago and gave some away. My dau-in-law made one that's all knitted! I will be praying for your health and hope you heal up soon in your back as well. I always like reading your blog and you sharing life, good and not so good. Hugs and blessings! Being shuffled from doctor to doctor is frustrating. Praying that you can find some answers and a solution to your health concerns. 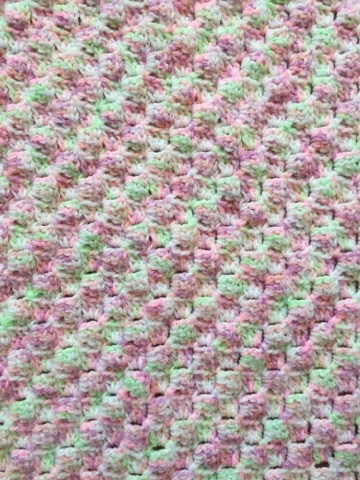 The baby blanket is lovely - I love the colors. 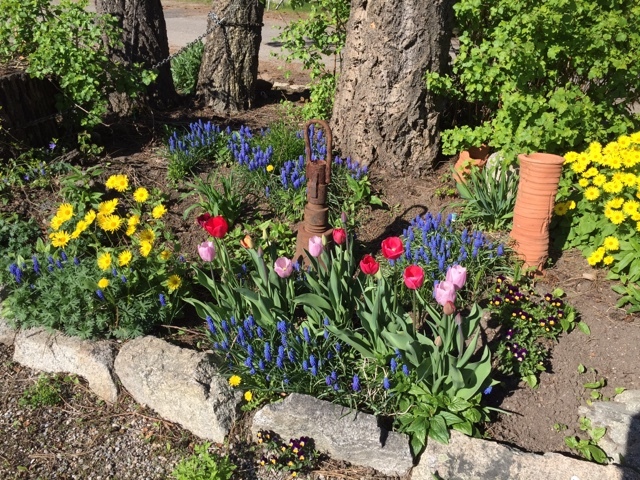 Hi dear Betsy, firstly before I forget, pretty pink flowers are tulips, purple are grape hyacinths and yellow are daisies I think or maybe a cinneraria of some variety. We may call them different names here. I love trap hyacinths. Prob should grow some as it's time to put them in here, in Oz. Is one I was thinking of I'll try copy few words for you... this hymn always blesses my heart and goes back to my childhood and early days of salvation as I went through many health trials. I took them almost fifteen years to properly diagnose me as endocrine was very new area at that time. Have you started for glory and Heaven? Have you left this old world far behind? In your heart is the Comforter dwelling? Can you say, Praise the Lord, He is mine? Gone back, and you seem all alone? With the toil and the heat of the day? As you journey along on life’s way? Does it seem He’s forgotten His own? Oh I love the assurance God gives us, through good old Bible based hymns. My family weren't saved but God used a Beach Mission to be my means of salvation at twelve, right when I needed it. You know dear sis, God has a higher purpose in the way He is taking us, I would not swap one part of my trials for smoother ways, as I'm so much richer in Him as a result of them. Love your knitting as always and yes I've had patterns like that one you kept undoing, curious isn't it. I've made up my own crotchet pattern for towel tops too. Prayer hugs dear sweet sis. Thanks for sharing your heart and surroundings! Betsy, I am so sorry you are having health issues again. I am praying that you find answers and healing! Have you ever listened to Pastor Rick Warren of the Daily Hope podcast? I find his podcasts very uplifting. Your flowers at the lake are beautiful and those cabins are so cute! Isn't C2C fun? I should make one for myself as I really enjoyed making them for others. I faved the shawl for the future...it's a beauty! Thank you also for the towel pattern. I'm going to Wally World today and I may pick up a towel to try it. They are so handy! Great for gifts too. Have a lovely weekend! having your mobility changed is tough Betsy. I will pray specifically for your back to heal. I pray you will be led in the correct direction for healing. Is swimming just so out of the question? Beautiful yard pics and lovely hand work as always. I will be praying for your limbo in the health care realm. God has lots of lessons for us in that waiting room, as I well know. I just posted a comment but the box disappeared so not sure what happened. Our internet connection is doing weird things lately. Dear, precious Betsy! I am SO sorry to know of your continuing health issues. I want you to know that I am praying for you and believing God to heal this...whatever it is. HE is the Great Physician, your Creator, the One who knows every detail of your anatomy and composition. Since He created you, He absolutely knows what to do to heal you. I do know that if your Vitamin D is deficient, this could certainly be contributing to much of this. I had no idea how many things are affected in the body, until my own Vitamin D was found to be so low. I am seeing some improvement as I continue to diligently keep up with taking Vitamin D supplements. I do trust the Lord that they find out what is going on soon, and that He will just heal you and make you whole. Don't ever feel that you cannot be real and honest here...life isn't always happy, happy, happy...far from it. We are here to help see each through this uphill climb called life, and we are to bear one another's burdens. I am so thankful you shared your heart and let us know exactly how we need to pray. You, my friend, are so faithful to pray for all of us when we need it...it is the least we can do to pray for you. Please keep us posted on how you are. Betsy, I'm so sorry you aren't getting better news about your back. How frustrating. I really hope they'll be able to figure out what's going on so you can feel better and be back to normal soon. I loved seeing the photos of the flowers. It sounds like spring is finally there. I hope you had a lovely Mother's Day today!